(2015). Meso-scale Modeling of Tension Analysis of Pure and Intra-ply Hybrid Woven Composites Using Finite Element Method. Journal of Textiles and Polymers, 3(2), 76-85.
. "Meso-scale Modeling of Tension Analysis of Pure and Intra-ply Hybrid Woven Composites Using Finite Element Method". Journal of Textiles and Polymers, 3, 2, 2015, 76-85. (2015). 'Meso-scale Modeling of Tension Analysis of Pure and Intra-ply Hybrid Woven Composites Using Finite Element Method', Journal of Textiles and Polymers, 3(2), pp. 76-85. Meso-scale Modeling of Tension Analysis of Pure and Intra-ply Hybrid Woven Composites Using Finite Element Method. 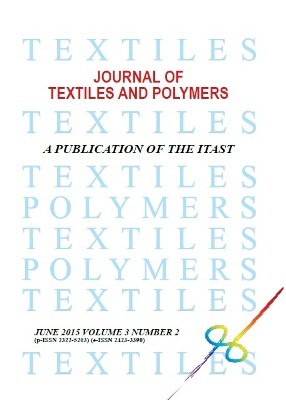 Journal of Textiles and Polymers, 2015; 3(2): 76-85. One of the key issues associated with using of composites in various applications is their tensile behavior. The tensile behavior of a composite material is strongly influenced by the properties of its constituents and their distribution. This paper focuses on gaining some insights into the tensile process of pure and hybrid woven composite reinforced with brittle and ductile yarns. For this purpose, mesoscale finite element simulations were performed to detect the tensile response within three types of composites: i.e, a brittle fiber reinforced composite, a ductile fiber reinforced composite and a brittle/ductile fiber reinforced composite. The numerical predictions were then compared with the experimental observations and the results were discussed to give some insights into the reinforcing mechanisms in the composites. Based on the results it can be concluded that this finite element model is a reliable tool in the prediction of the tensile behavior of pure and hybrid composite materials.